There is lacking in our educational system across the United States a curriculum that teaches and emphasizes the attributes of integrity based upon honesty and truth. Where and when did such attributes of truth, justice, and righteousness evolve? Was it revealed to mankind as revelations from God or developed by the experiences of different communities interacting with one another to establish harmony between their people? Our educators can provide answers to their students based upon an ancient civilization that created awe inspiring temples, pyramids and monuments due to their beliefs that embodied the attributes of truth, righteousness, and justice. This paper offers a wealth of historical information of the development of Egypt’s civilization and religious beliefs. The author reveals how their beliefs were emulated by other groups of people to develop the major religions of today; namely, the Judaic, Christian, and Islamic religions. In addition, a comprehensive critique of the Torah, Gospels, and the Qur’an is given to demonstrate the connectivity of these scriptures to Egyptian hymns and religious beliefs. Finally, the author takes the reader further to study recommendations and solutions of the differences in religious beliefs that have created bigotry, hatred, violence, and the killing of innocent people. The figure below presents an overview how Egyptian hymns (scriptures) were emulated by the Hebrews in their development of the Torah, which later gave birth to the Gospels and Revelation. For the books featured on this post, you may visit the author’s website below for overviews and reviews by highly respected scholars, authors and journalists. Dear viewer, I have a few questions. Do you agree that religious leaders of the Judaic, Christian and Islamic faiths have a mandate, as representatives of God, to insure they all work towards unifying their scriptures to teach the greatest command given by a Man of God – Love one another? Or, should each of these faiths persist in claiming they have the true religion or path to God? Do you know who was that Man of God? I think leaders of religions today should deal with an evidence based approach to religious truth. Namely, identify the historical claims of religion which can be proven or disproven based on historical evidence, and let this evidence inform them concerning the truthfulness or erroneous nature of their Scriptures. Take for example the resurrection of Jesus. Historians have developed a consensus that there are 4 well established historical facts about Jesus. His burial by Joseph of Aramithea, his empty tomb, the fact that his disciples experienced appearances of him after his death, and the origin of belief in his resurrection. Many hypothesis’ have been developed to explain away these 4 facts, such as the apparent death theory, the hallucination hypothesis, the myth theory, the conspiracy theory, etc, but one and all fail to explain all the facts in a meaningful way. None of the theories have gained any strong following among scholars. In the absence of any naturalistic explanation of these facts, its reasonable to conclude that the answer the disciples gave was indeed correct, that God raised Jesus from the dead. I don’t think its right to change the Scriptures, but rather, seek out which Scripture, if any, contains the truth, and let evidence guide that search in parallel with one’s walk with God. Once scientific evidence has been able to confirm which Scripture is correct, that should be promoted. To just change the Bible to fit what we believe would be to assume that God has not spoken, and we are free to make up what we want God’s word to be as we go along. I think that is extremely arrogant. Thank you for your comments to Provide History of Religion and God. I am sure they will be instructive so that people may appreciate another view that may strengthen or modify their own beliefs about God and religion. You brought up two thoughts: one was concerned with religious leaders presenting facts based upon evidence to prove the authenticity or truth of their Holy Scriptures; and the other was that Scripture is inviolate as God’s Word and should not be changed to fit what we believe. History reveals that men learned to live together in a harmonious way by the formulation of moral codes that were implemented by the Egyptian Priesthood. 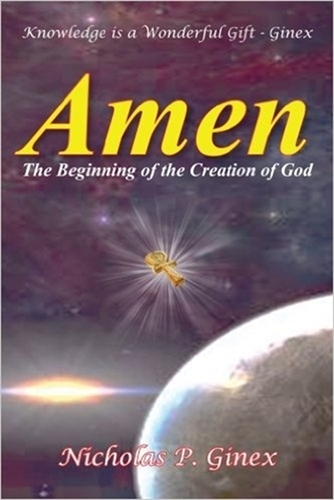 The result was the greatest formalized religion, and perhaps the first, that believed in one Creator God called Amon. That God is now known as Amen. His name is sung and spoken in many houses of worship at the end of a prayer, giving thanks and praying for a good outcome. 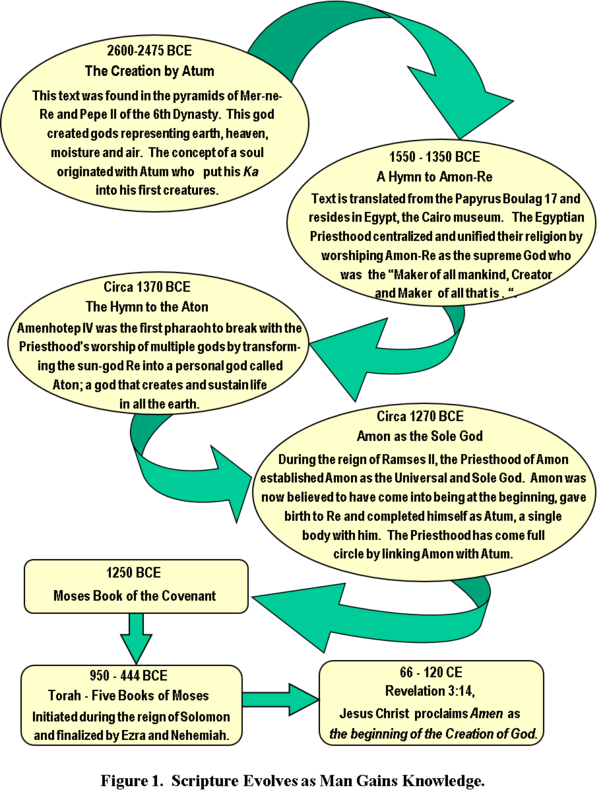 History teaches us that Scripture evolved as the Egyptian Priesthood sought to embody their beliefs in hymns praising and extolling their God. This meant that Scripture went through many transformations and, in so doing, has developed a detailed personal belief of God that could provide the prospect of a righteous mortal achieving eternity in a Hereafter after death. Therefore, in answer to your 2nd thought, I wholeheartedly believe that Scripture has been written by gifted men inspired to improve the morality of mankind. Such Scripture has evolved from the holy thoughts and beliefs formally developed within the minds of men. Read Future of God Amen and you will find that many passages in Genesis of the Old Testament were extracted from some of the beautiful hymns written by the Egyptian Priesthood. Scripture is therefore not inviolate, but can be, and should be, changed as mankind evolves. It is an opportunity for gifted, loving and perceptive people to replace myths and abominable passages with God’s greatest command that emphasizes morality, truth, justice, and integrity. It is not arrogant to improve our Scriptures. Certainly, the Qur’an is full of abominable commands that promote bigotry, hatred, violence and the killing of innocent people who do not believe in the Islamic God Allah. This Scripture is a manual to indoctrinate people and have them kill those who believe in a God other than Allah. Therefor no Scripture is cased in concrete except by those who are arrogant to believe that have the only true religion and that it will prevail over all others. Daley, regarding your first thought, religious leaders should provide the facts as to why we believe in God and the history of how our beliefs have advanced to conceptualize the God portrayed in Scripture. I will not indulge in any arguments that support or disprove whether or not Jesus was resurrected and is sitting at the right hand of God. We should not remember Jesus for dying on the cross but rather, we should remember the Word of God he gave to mankind. It is the greatest command in the New Testament and he announced the Word of God 3 times, not as a thou shalt but as a command – love one another. I believe Jesus is a Man of God or, as he so often said, he was a “Son of Man.” The Christian Priesthood has promulgated a lie to form the idea of a Trinity and teach Jesus is the Son of God. Jesus in all four Gospels stated he was the Son of Man 76 times, and others have stated 5 times, he is the Son of God. I rather believe in the words of Jesus than the word of others. Daley, I hope I have answered your thoughts. They are the kind of thoughts many other people have considered. Truth is hard to come by but I hope my research will prove to be of value to you and others. I humbly recommend people visit my website http://www.futureofgodamen.com to review the books that provide a history about religion and God. Next Next post: Does Consciousness Pervade the Universe?